I love Autumn, it's without a doubt my favorite time of year. It used to compete with spring because both are times of significant change but over the years Autumn has won out again and again because there's always so many beautiful decorating and crafting opportunities in Autumn that you just don't find in the spring. The other day I ran across someone who also agrees Autumn is her favorite time of year and she celebrates it by making some of the most beautiful hand crafted jewelry I've ever seen! I first noticed her from her avatar on the Etsy Forum, which feature s what is, without a doubt, my favorite piece of jewelry I've seen on Etsy to date! 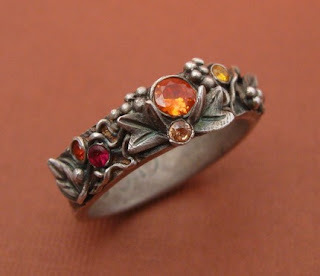 That would be Jane Font's Autumn Garden Party Ring in Fine Silver. Not only is the ring absolutely gorgeous, but this is a woman that really knows how to take a picture! I've browsed (and drooled!) my way through her shop and she never fails to impress both in her beautiful jewelry as well as her terrifically detailed photographs that show her work off to perfection. DaisyJaneDesigns is part of the Etsy MetalClay Team, and if her work is any indication? I really -have- to go take a look at more of their artists! YOU CAN CLICK ON THE PICTURE ABOVE TO VISIT DAISYJANEDESIGN'S ETSY SHOP OR, IF YOU PREFER, CLICK RIGHT HERE. I can honestly say that I'm not -usually- a doll person. It's not my thing. I mean, yes, yes. I'm a girl and occasionally I topple for a little plushy crush now and then but on the all, just not my thing. That said, I stumbled across the cutest little doll today when I was perusing stocking stuffers in an Etsy Forum post and I just had do share! Isn't she adorable?? The minute I saw her, it made me smile. 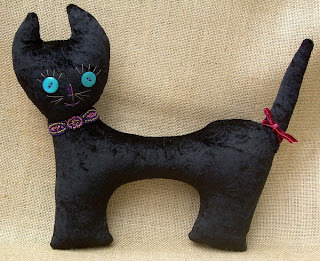 This Lucky Black Cat Art doll is made by StitchyWooWoo over at Etsy. She has a whole lot of really cute dolls and I love her cats. Her shop is filled some terrific photographs of them all too. There's plenty there for every consummate shopper to peruse through and if you like cats or dolls? This should definitely be on your lists of must-see shops. So go check her out! I'm sure she'd love to have you stop by. TO VISIT STITCHYWOOWOO'S SHOP YOU CAN CLICK THE PICTURE TO THE LEFT OR, IF YOU RATHER, CLICK RIGHT HERE! Labels: shopping etsy StitchyWooWoo "art dolls"
Okay, okay so I told myself when I joined Etsy to sell my stuff that I wouldn't go willy-nilly buying everything I ran across that I fell in love with. And for the most part? I've kept to that promise. 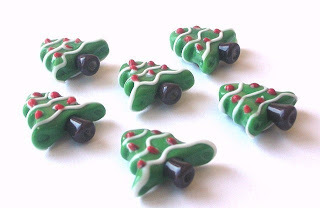 On the other hand, I just couldn't resist these little Christmas tree lampwork beads. They are SO adorable. 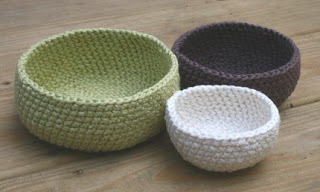 I wish I could have bought all 12 she has available but I made myself show some restraint and bought a set of four. Mindielee has a lot of cute stuff like this in her Etsy shop too! She shows some real talent and a wonderful eye for vibrant eye-catching colors that you just don't see that often turn out classy instead of cheap. She pulls it off beautifully! You should check out her shop if you have a chance. She's really friendly too! I needed to work with her in email for payment due to a PayPal server hiccup and she was great. YOU CAN CLICK ON THE PICTURE ABOVE TO VISIT MINDIELEE'S ETSY SHOP OR, IF YOU PREFER, CLICK RIGHT HERE.